When I was 8 and living in Florida, my grandfather took me to a Par 3 golf course. Back then they were referred to as "Executive Golf Courses" except I never saw any executives. (Mostly I saw guys in tank tops or retired folks.) He handed me a 9 iron. The grip was old and tattered, the shaft was rusted and made of heavy steel, and the club face was a blade about the size of a butter knife. The terms "Hybrid" and "MOI" would not enter our vocabulary for years to come. Man, you kids have it easy today! I teed the ball up like grandpa showed me, and wrapped that huge club around my head like I was Willie Maze, closed my eyes and swung with all my might. “WHACK!” I caught my grandpa square in the shin and dropped him like an enemy soldier. After that, we put off golfing for a few more years. 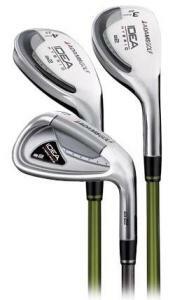 If I were starting my golf career today, I'd pick up a set of these Adams Golf A2 Irons. (Adams practically invented the hybrid and is the leader in this market.) If gramps had handed me one of these when I was 8, perhaps I’d be on the PGA Tour by now, because the clubs are so easy to swing from the very first time out. This set has all the latest technology to get you going to the first tee. And the set is not that expensive. All of the clubs are designed to help the beginner get the ball airborne and flying high. Starting with the 3 & 4 hybrids – These are a very similar design that is played on all the pro tours. They look like woods but play like irons. The main thing to remember with these clubs is to swing with a good tempo. A lot of people when they get a wood in their hands try to swing for the fences. The nice thing about these clubs is they will go farther if you swing easy and hit them on the sweet spot, then if you swing out of your shoes and catch it on the toe. Once you get the hang of them, you may even want to play them off of the tee rather than hitting your driver. The 5 - 7 irons have a hollow back design which moves the weight back and low, and the 8 - PW are full cavity backs. These clubs are easy to swing, and the coolest thing about this set is that you're not going to outgrow these clubs too quickly. I think you'll enjoy playing these clubs up until the time you decide you're good enough to start hitting the sweet spot of the clubface consistently, and you want to try to work the ball a little more. When you do reach that advanced level let me know. I still have that 9 iron my grandfather gave me, and I guarantee you, you won't be able to hit it.